Art Deco style polished nickel single wall light with elegant curved arm detail, complemented by a beautiful art glass, Art Deco style feather ribbed glass shade. The art glass shade has been entirely handmade, no paints, dyes or stains have been used to create this beautiful feature glass shade. This beautiful Art Deco 1-lamp wall light will adjust to give you an upward or downward facing arm, supplied with art glass shade. The techniques used to make these art glass shades have been used by glass makers going back centuries. Today, only a very few glass makers retain the skill and knowledge to produce a glass of this standard. A beautiful Art Deco style feature single wall light complete with an Art Deco style feather ribbed glass shade. 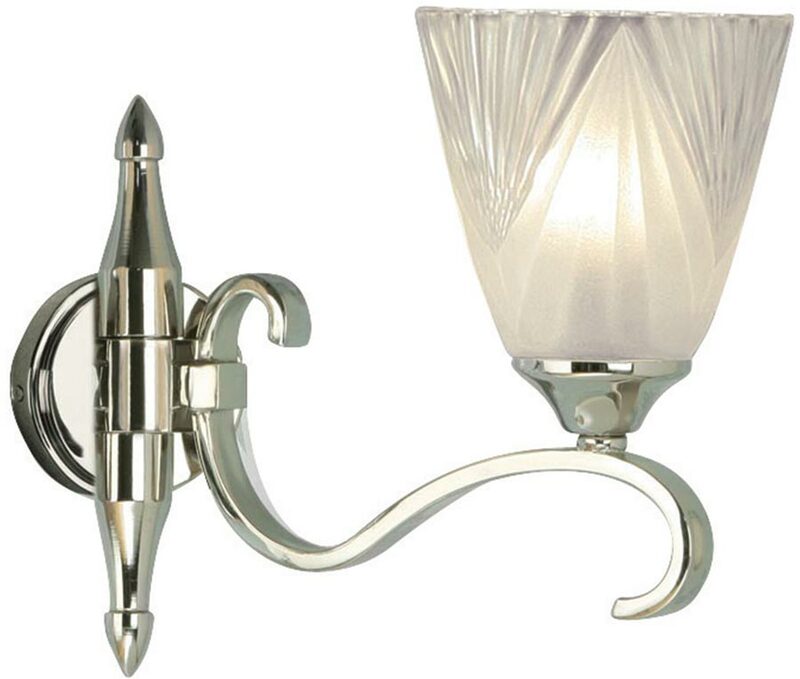 From the Columbia polished nickel Art Deco style lighting collection, designed and manufactured by Interiors 1900.